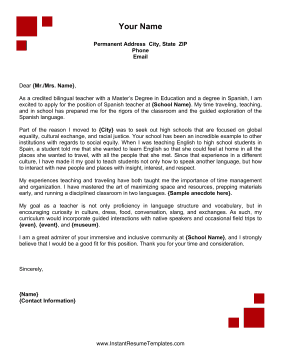 Apply for a job using the skills you learned studying abroad with this printable cover letter featuring corner red blocks.Match the set! Create a unified and professional application by pairing this cover letter with the matching resume here. More sample cover letters can be found at CoverLetterExamples.net. Matching business card can be found at Free Printable Business Cards.net.